Home / Blog Posts / Is Your Child Having a Terrible, Horrible, No Good, Very Bad, Week, Month, Year? Your child has it so good, right? 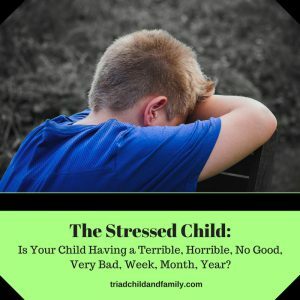 No responsibilities, no boss to answer to, no bills to pay… So, how could your child possibly be having a terrible, horrible, no good, very bad, week, month, year? One word… stress. How did this happen and what can you do about it? Read on to find out the answer. Unfortunately, stress doesn’t discriminate among age; it can affect anyone who has the ability to feel overwhelmed. Not surprisingly many of the same things that cause us stress as adults can also cause our children stress: world news, a sick family member, divorce/separation, other issues at home like finances, and grief over the death of a loved one to name a few. In addition, some common child stressors include: pressures in academics, friendship conflicts, and other mental health issues like, Attention Deficit Hyperactivity Disorder (ADHD) or Generalized Anxiety Disorder (GAD). It’s important to tune in to your child’s life, identify the things that could cause them stress, monitor their stress level for a couple of weeks, and then, using the questions located BELOW, determine the best course of action to lower your child’s stress level. It’s important to note that not all stress is bad, and the goal is not to eliminate stress completely. In fact, a certain amount of stress is common and a very important part of development to ensure your child learns the coping mechanisms needed for the stress they will inevitably face as adults. Keep in mind that everyone copes with stress differently and what works for you may not work for your child. For example, perhaps you go to the gym after work to relieve the stress of the day so you think your child should be more active, but maybe your child already plays a sport and rides their bike with their friends everyday, yet they are still stressed. Clearly your child is going to need a different way to cope with stress other than physical activity. Don’t get discouraged if you’re not sure how to help your child, sometimes you and your child may need a little extra support acquiring and practicing coping skills. Keep reading for warning signs of too much stress, and other stress relieving activities to try. So how do you know when the stress is too much for your child? What is the frequency of the stress related behavior? Has it occurred consistently over a period of two or more weeks? Has your child started to engage in stress-related coping behaviors, such as nail biting, thumb-sucking, picking at skin, or hair/eyelash pulling? Have you noticed drastic changes in their mood or mood swings? Has their basic health changed, such as sleep or eating patterns, or self-help behaviors? Has their performance in academics and/or behavior at school changed? If you answered “yes” to any of the questions above, and especially if you answered “yes” to several, please be proactive and seek the professional mental health counseling services that can make your child’s life, and your life, calmer, more stable, and overall happier. If you find that you or your child are still in need of assistance with stress coping skills please consider making an appointment at Triad Child and Family Counseling. Hannah Cox, LPCA works with children of all ages. For younger children Hannah uses play therapy to discuss stress, feelings, and ways to cope. Adolescents will benefit from Cognitive Behavioral Therapy, in which Hannah focuses on the thoughts behind the stressors, helps to reframe negative thoughts, and teaches coping skills to enable your child to become more resilient in dealing with future stressors. Triad Child and Family Counseling specializes in working primarily with children, adolescents, and their families. Make sure your child is getting plenty of sleep at night. Spend more quality time with your child. This should be a time where your child takes charge of what and how to play. Put away cell phones and other distractions during this time so your child has your full attention. Don’t pressure your child to talk, but let them know you are available if they want to talk. Start an exercise program with your child. Encourage your child to use a journal to write down their feelings.